Cooper Barrett’s Guide to Surviving Life TV show on FOX cancelled after one season. Justin Bartha, James Earl, Jack Cutmore-Scott, Meaghan Rath, and Charlie Saxton. Credit: Michael Becker / FOX. © 2016 FOX Broadcasting Co. The Cooper Barrett’s Guide to Surviving Life TV show on FOX has been officially cancelled after its first and only season. This comes as a shock to no one who has been following the low-rated freshman comedy series. FOX previously demoted the show out of primetime, then wiped it completely from the schedule during May sweeps, replacing it with reruns of The Simpsons. There is no word from Deadline, on whether FOX will burn off the remaining episodes of Cooper Barrett’s Guide to Surviving Life, but that seems unlikely. Thirteen episodes have been produced. “How to Survive Your Parents’ Visit,” guest starring Alan Ruck, Jane Kaczmarek, and Juicy J (Jordan Houston) — the last new episode on April 17 — was only the 10th to air. 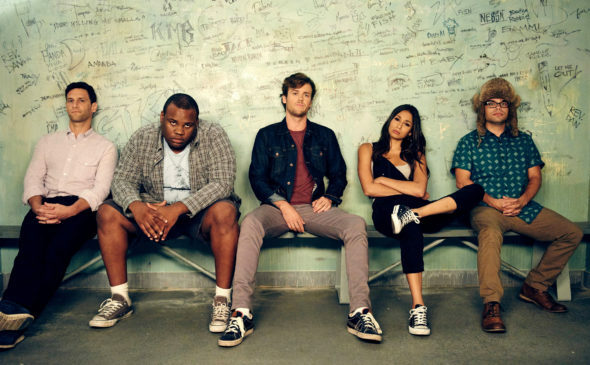 The series starred Jack Cutmore-Scott), Meaghan Rath, James Earl, Charlie Saxton, Justin Bartha, and Liza Lapira. Should FOX have cancelled the Cooper Barrett’s Guide to Surviving Life TV series, or should it have been renewed? Were you a Cooper Barrett’s Guide fan? Sound off, in the comments. More about: Cooper Barrett's Guide to Surviving Life, Cooper Barrett's Guide to Surviving Life: canceled or renewed? Cooper Barrett’s Guide to Surviving Life: Cancelled? Is Tonight the FOX Series Finale? Nooo, why??? Really reruns of the Simpsons!!!! Who does that… I just watched this on Netflix and I have watched it all day. Make a season 2 because if more people knew it of it. It would be a better rated show. Season 2 Season 2 Season 2 Season 2!!!!! Come on fox, don’t do this. I just started watching this series and I fell in love I’m soooooo pissed of that y’all canceled it!!!!!!!! Please bring it back! Its freaking amazing and funny af!!!!!! No…please ‘un-cancel the show…this show was awesome!..Is awesome! Doesn’t make sense how you air other dumb shows but not the good ones like ‘Cooper Barnett’s Guide to surviving life’. Please make season 2!! !